Do you ever find yourself eyeing those convenience boxes of flavored noodle pouches in the store. You know the kind, cook your own cheddar broccoli or alfredo noodles that are packaged as a quick side dish? Well, here is a great one you can make yourself! Alfredo noodles are the perfect side dish with your grilled or baked chicken. Plus, the benefits of making your own packets are 1) You already have the ingredients at home, so why spend more money on a prepackaged pouch. 2) You can easily control the ingredients 3) No added chemicals or preservatives! 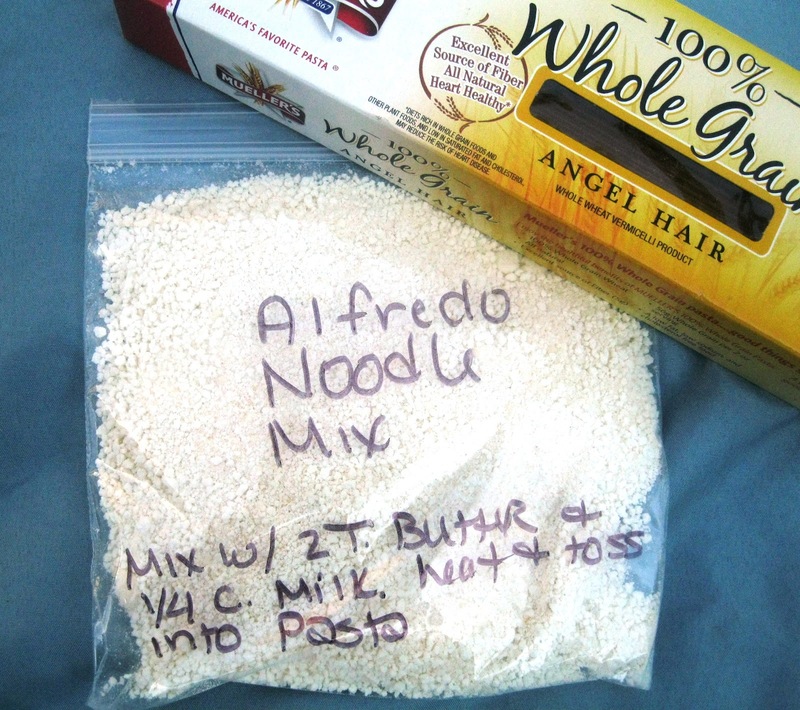 Remember, this mix is not meant to replace your homemade from scratch, rich, yummy Alfredo recipe! This for those nights when you need a quick side dish! Feel free to add your own seasonings to taste. I usually just package the sauce packets alone and cook pasta from my pantry, but you can package them like my Hamburger Helper Kits and put noodles in a gallon sized bag and tuck the sauce packet in the big bag also. I cook about 8 oz. of dry angel hair or fetuccini pasta which is about 1 1/2 inches diameter bunch. Mix above ingredients together and divide evenly into 2 ziplock bags or air tight containers. Attach the following directions to the sauce bag. Cook 8 oz. of dry pasta, drain. While pasta is cooking in saucepan or microwave safe bowl, mix alfredo mix, 2 Tablespoons of butter and 1/4 cup milk together, stirring till sauce is well blended. (I left out salt, so salt to taste). Toss gently onto drained pasta. serve.